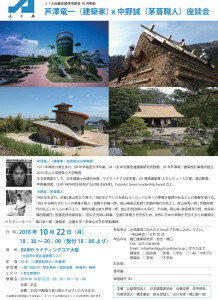 There will be a lecture, part of the Houseing Group of The Japan Arvhitectus Associatoin, Lecture series at DAIKO Writing Core Osaka in Osaka on 22 October. Please apply for registration at Hashiguchi Building Res. Inst. At LIVING & DESIGN 2018, we will exhibit ”Reed, Driftwood, Plastering” as a theme at 10 new materials.